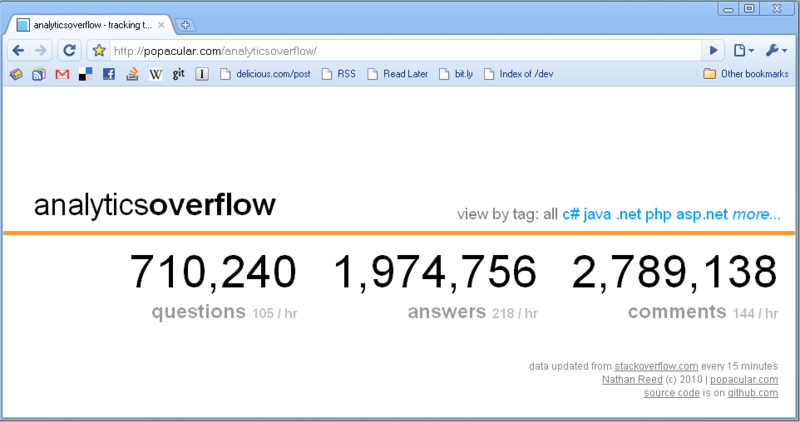 I've written a counter of Stack Overflow events that the community might find interesting: http://popacular.com/analyticsoverflow. The data are updated by screen scraping Stack Overflow once every 15 minutes. In between the actual source updates, the numbers are just guessed based on the average rates. Very good one, and those numbers are very close also, when I check it through stackoverflow private beta api, You might want to join it also. Note that beta api cannot be use on live site.